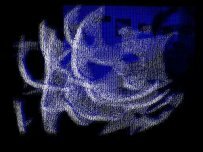 Simulation of a dynamical neural network excited by the live video of the observer. Hans H. Diebner: Liquid Perceptron 3D. Screenshot. Hans H. Diebner: Liquid Perceptron 3D. 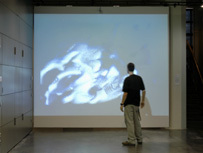 This installation is an extented version of the two-dimensional variant Liquid Perceptron 2D developed by Sven Sahle and Hans H. Diebner in 2000. For a comprehensive documention of the conceptual background please switch to the 2D variant. The simulation of a neuronal network is excitable through the movement of the spectators. Comparable with the eye, a camera recognizes the movement of objects in space and transmits the video signal to the neuronal network which is composed of roughly half a million neurons arranged to a block, each coupled with its neighbor neurons. The activity of the neurons is color-coded. Bright areas are particularly active. One recognizes that local excitations lead to the formation of coherant patterns, much like observed in brain activity visulizations. The activity fronts spread of the whole network. The information corresponding to "perception" is represented in the global activity patterns rather than in each single neuron. 7th Videofestival of Lima / 7. 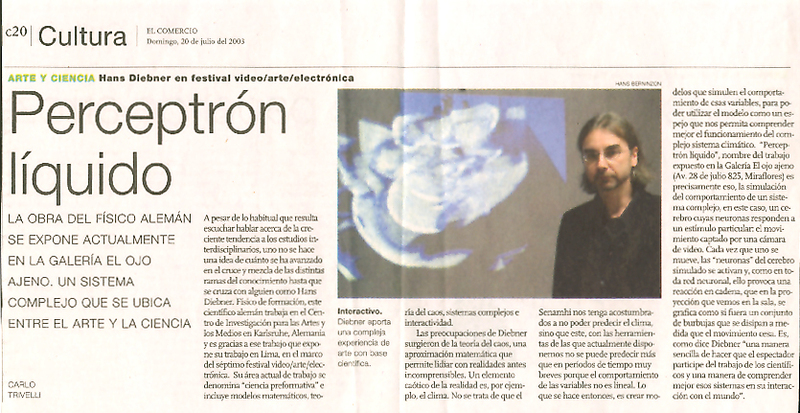 Festival de videoarte. "Perceptron liquido". In: El Comercio, Peru, 20.07.2003. "Perceptron liquido". In: Expreso, Peru 10.07.2003. ZKM | Medienmuseum, Karlsruhe, Germany, Oct 2004 - March 2005.